Service will be come available shortly! Typical repairs can be completed in 2 weeks depending on workload. We will promptly return an estimate! 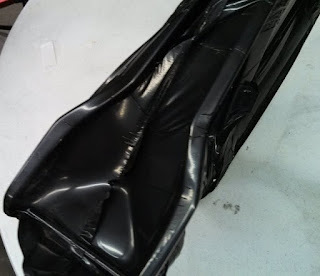 We are more than happy to look at any type of composite repair. Please contact us for a quote. The damage resulting from a cable being repeatedly ran over the paint & clear coat, over time it ate away a few layers of carbon! 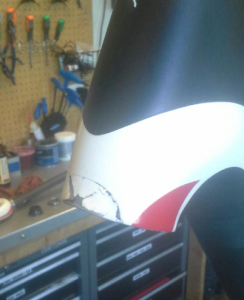 Really should have gotta picture of it before the repair was started. 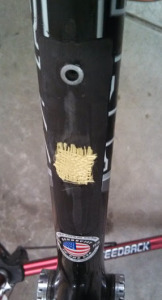 Anyway, this is the area that was removed to get the small crack out. 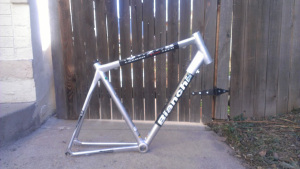 This go around, we decided to venture away from doing bare carbon and clear. 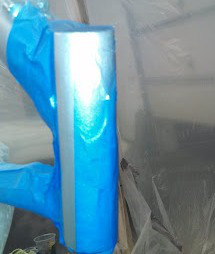 This frame had all sorts of little blemishes in the silver that we repainted and cleared. 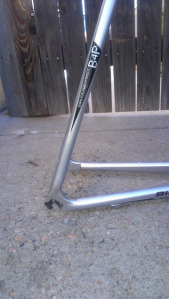 This is what you get when your handle bars spin and slam into your top tube. 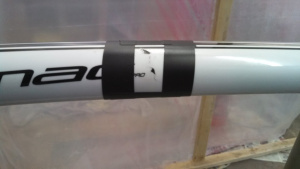 Fortunately the damage wasn’t as bad as it initially looked and this crack didn’t go beyond the second thin layer of carbon. A little sanding on either side of the crack to give enough bonding surface and a little bit of carbon this thing was good as new. As always a layer of clear coat goes on for UV protection and shine. 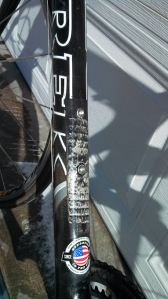 Fortunately this Roubaix was not nearly as damaged as the last one we repaired. 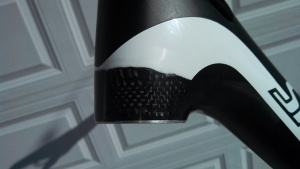 This crescent shaped crack was localized to the paint and first few layers of carbon fiber. After removing the paint around the bottom of the head tube, the individual layers of fibers were exposed stepping up outward so that a new structure could be installed that would adequately transfer the stresses into the undamaged portion. Though this frame is destined for a paint job to match the original at some point, it never hurts to add a layer of UV protection that makes paint optional. 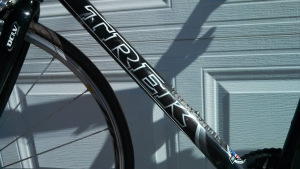 At some point the water bottle nut pulled out of the down tube on this Trek. 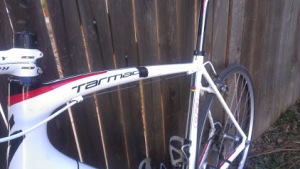 That however did not stop the owner from riding it. 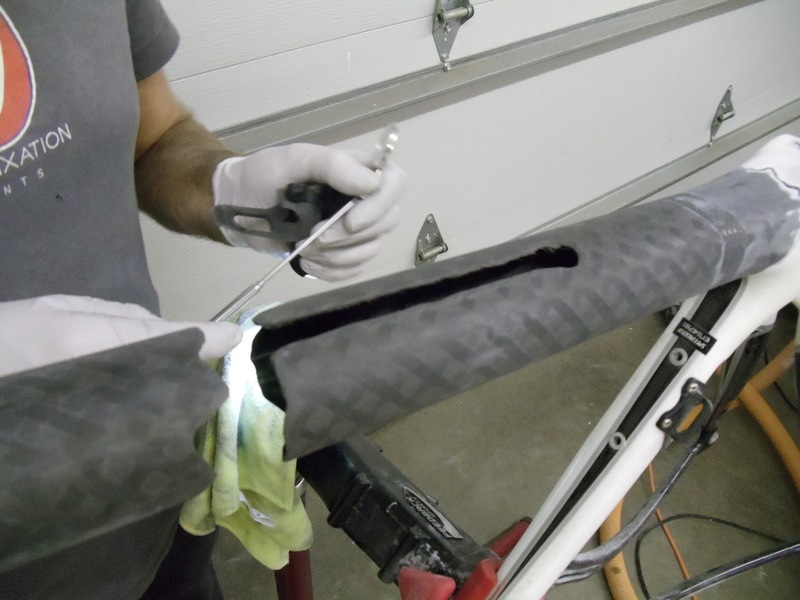 What did eventually stop them was when the outer layer of carbon fiber started do de-laminate along the seam, down towards the bottom bracket. After removing the layer of unidirectional that had come up, a patch was placed over the hole. 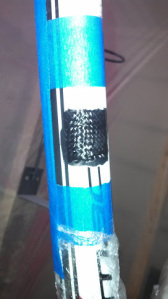 This patch contained both carbon 3k weave and a layer of kevlar for extra strength. The unidirectional structure was then rebuilt and a solid tube was formed. 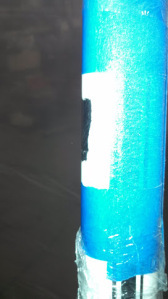 The location of the nut to be re-installed was then located and carefully drilled. 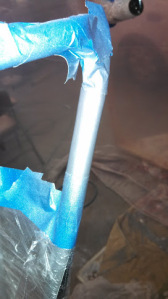 After the edged of the hole were sealed up and the nut installed, a layer of glossy clear was added for looks and UV protection. Falling on sharp objects hurts. 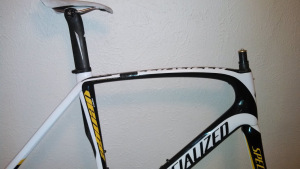 This Venge arrived in our shop mid-day on Wednesday. 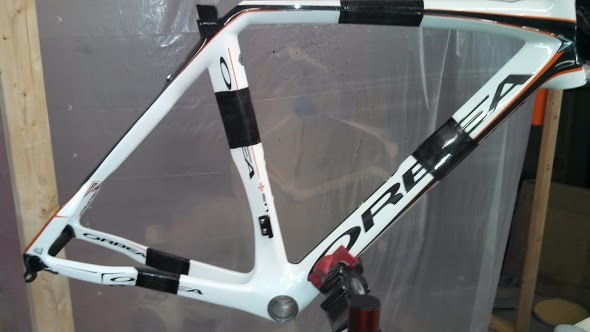 We had just finished prepping the Orbea from our last post for clear coat, so we put a rush on this repair to get them both done by the weekend. 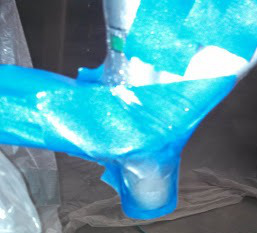 By Wednesday evening we had the crack patched up and vacuum bagged in a nice warm area to cure overnight. 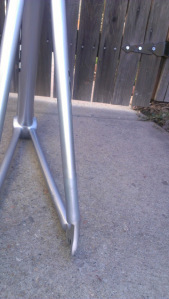 By Friday afternoon, the clear coat from the day before had dried and cured enough for a quick wet sand and polish. After it fully cures a nice coat of wax would look really nice. 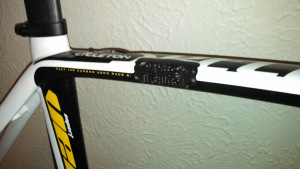 The crack running vertically along was made by handlebars smashing into the side during a little mishap. The side of the tube, where the black is located, is actually a U-shaped depression in the side of the overall oval shape. 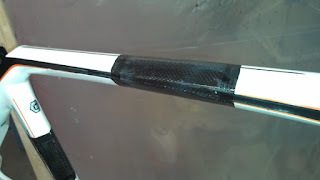 When the handle bars spun into the raised points, the brittle carbon edge shattered. 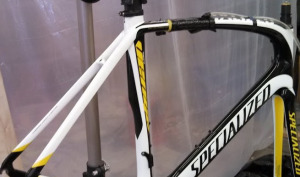 This bike was considered destroyed and was replaced under a crash replacement plan. One more thing had to be done before it could be replaced under warranty. 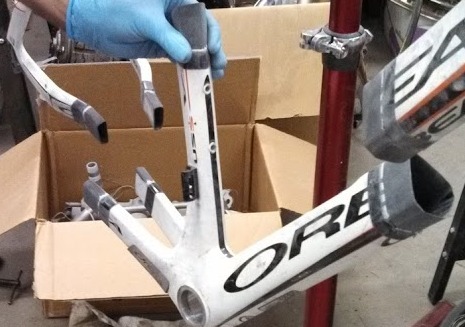 The bottom bracket needed to be cut away from the rest of the bike so that somebody couldn’t just slap a patch on the top tube and suddenly have two bikes. The mechanic who cut it in half used a nice hack saw and went to town right in the middle where there was plenty of clearance for easy movement. Instead of going to the dumpster, the two halves eventually ended up in our hands where we sanded them down and assessed putting it back together. After alignment and an initial repair to hold the two halves together, the structural repair was laid up on top and then a vacuum drawn over the entire repair. After placing a dummy axle in the rear we positioned the bag in between the stays so that they had even pressure all around them and were not being pulled together. 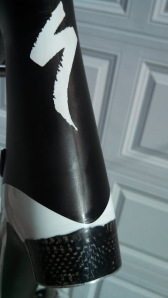 We decided not to try and match the paint, but instead put a nice layer of clear over all five repairs, and let the carbon shine through. 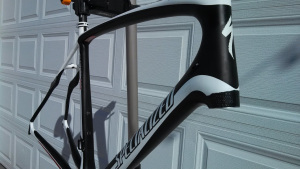 For our very first repair, we have this lovely Roubaix that headbutted a garage. 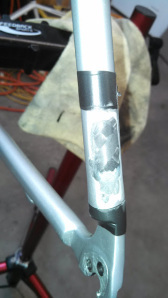 It did not fare so well and ended up with a nicely destroyed down tube and a semi-related crack to the chain stay. 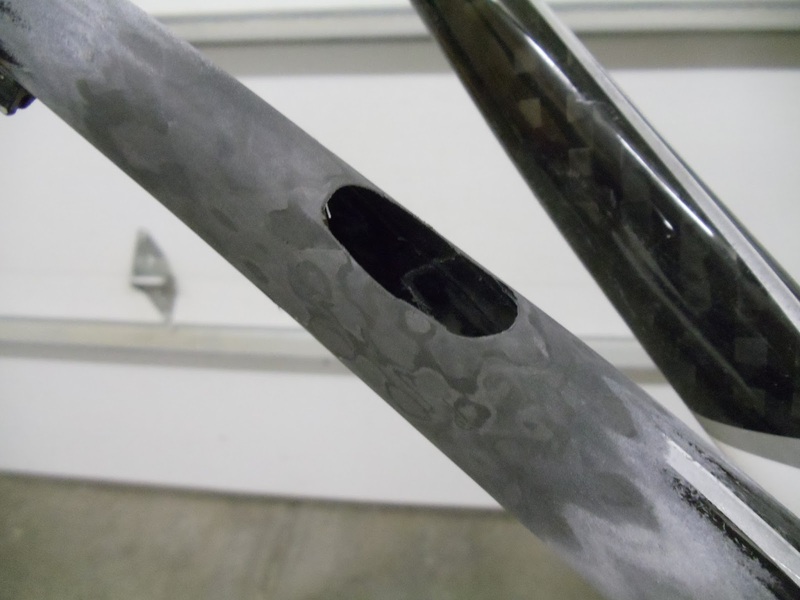 This is the downside view of the down tube after we cut out all of the nasty shattered carbon. 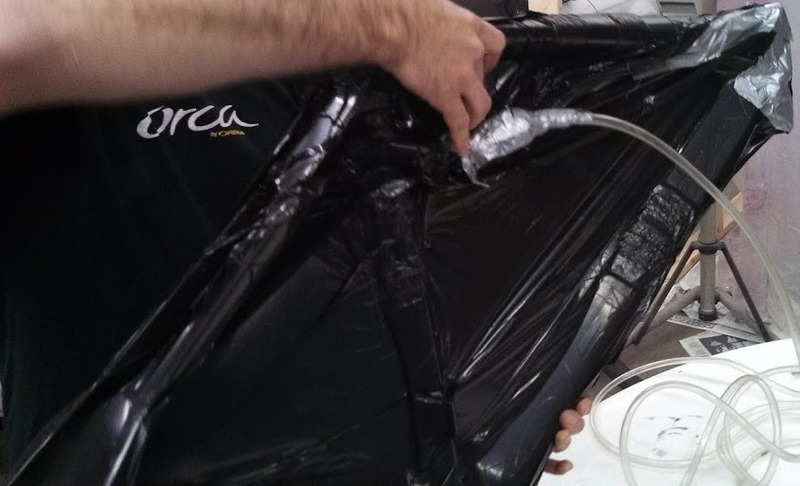 We tried our best to match up fiber orientation and thickness to the original. This is the drive side chain stay that has a matching hole on the opposite side. 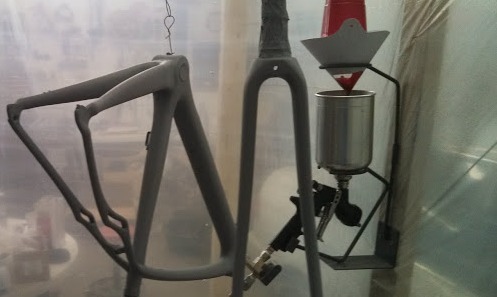 Here the frame and fork are after receiving a full sand down to carbon to check for additional cracks and to prep for new paint. This is after the primer. 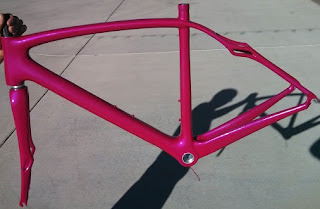 Here is the final product in hot pink pearl. Just need to re-install the cable mounts and this thing will be ready to be rebuilt and tested.